Description: We specialise in cuisine. We also offer a range of popular Indian dishes. We are fully licensed. We have a friendly staff and a welcoming atmosphere. We are situated 50 yards from the Ipswich Marina, 100 yards from the UCS. There is free of road parking (up to 3 cars in the alley way next to the building) and parking at the UCS 100 yards away. We visited Mehfil last night on the recommendation of a friend of ours. It turned out to be a hidden gem! The food was fantastic. My wife's chicken tikka massala was full of flavour and very creamy. My lamb jalfrezi was very warming! A jalfrezi can vary in heat from restaurant to restaurant. Nobody's fault but tasty nonetheless. A special mention for the keema naan also. One of the best I've ever had. Ferrero rocher ice cream for dessert capped off a great evening. Will definitely be coming back here in the future. We were at a Birthday 50th for the weekend of 22nd march 2016 so had a takeaway from here on the Friday as the house we were staying at ( Old Neptune ) was behind the resto and the smell was lovely. Everyone said their take aways were good but the shells on my prawns were left on at the tails which made for a crunchy, messy eat as I had to fish each shell off from my mouth at each mouthful. I had intended to take the remainder tails back to show them but I did not make it in itme, so I hope the restaurant takes heed. - WE DO NOT LIKE EATING THE TAIL SHELL thanks ! Dear Edward, thank you for your review. After reading for your comments we have changed the way we prepare our prawns. We now use prawns without their tails on. I believe there may have been a misunderstanding with the comments one of our staff made on the night you came in for a takeaway. We have regular customers who continue to come in on a regular basis for a meal. We are a new business, it is the attracting of new customers that is a challenge. I apologise for any miscommunication that may have occurred. It would not have been intentional. Thank you once again for providing a very informative review. Your observations made on the interior of the restaurant when you came in for a take-away collection have given us plenty to think about. We will continue to invest in the restaurant. It will take time like all businesses. 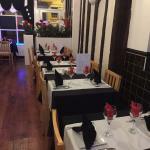 Been to Mehfil Indian Restaurant? Share your experiences!